Worship is the central focus of every believer's life and the motivations for our acts of service to the King. We are His dwelling place, and here at Pittsboro Baptist, we strive to build a House of Praise that will magnify Him. The Music and Worship Ministry include ministries that bless the church body and that provide opportunities to develop your gifts to the glory of God. Consider joining us and serving in our Sanctuary Choir, Sr. Adult Choir, praise band, praise singers, Kidz of Faith, Prayze Choir or Drama Team. Our Sanctuary Choir is made up of a group of people who love to express their love for God through song and leading others into His presence. It is the job of the Sanctuary Choir to present music and set the worship environment that, first of all, glorifies God but secondly that will lead others to a deeper worship experience with God. They rehearse the first and third Thursday evenings of each month (with the exception of July) at 7:00 p.m. This choir is for anyone 16 and up. The Sanctuary Choir is always looking for more voices to celebrate their love for God. The Sr. Adult Choir is for 55 and up. This is a group that enjoys the choir because of the fellowship and ministry it provides. They sing at the local nursing homes and on Sunday services throughout the year. They rehearse on the first and fourth Thursday evenings September through May at 6:30 p.m. They join the Sanctuary Choir to present special or seasonal programs. PBC Praise Band - This band is made up of musicians that love to praise God with their instruments. If you would like to join us, please contact Debra Magee. PBC Praise Singers - The Praise Singers are members of the Sanctuary Choir. They are singers who love to worship God and lead others in songs to praise and worship God during the cooperate worship time. Rehearsal for the Praise Team is every 1st and 3rd Saturday afternoon 3:00 - 5:00 p.m. If you would like to be part of the Praise Team please contact Debra Magee. Kidz of Faith is a group for our young people, ages 5 up. August through May they meet every Sunday afternoon from 5:00 p.m. - 6:00 p.m. They sing in "Big Church" throughout the year and perform seasonal programs. 1Way Youth Choir is a choral group for tween and teens, grades 5th and up. They meet every Sunday afternoon from 5:00 p.m. - 6:00 p.m. 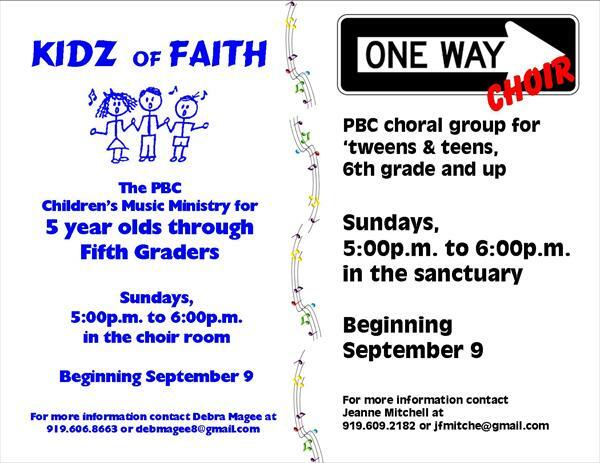 If you have a child or children or know of children in these age ranges please tell them about Kidz of Faith and 1Way Youth Choir. We would love to have them! The Drama Team of PBC is a talented group of people who enjoy sharing their love of God through drama. The drama team is involved in short skits, Judgement House, Christmas and Easter presentation. If you would like to be part of this team contact Debra Magee.